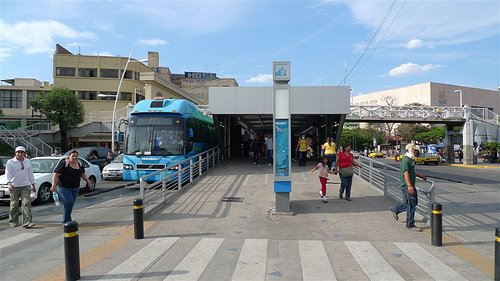 Recognized for its new Macrobus BRT system, Guadalajara is one of the nominees for the 2010 Sustainable Transport Award. Photo by itdp. 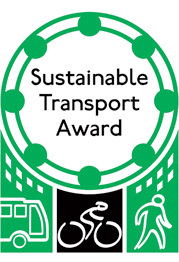 Last year, New York City became the first U.S. city to win the 2009 Sustainable Transport Award. As reported on EMBARQ.org, the city was recognized for its significant transport reforms, as a continuation of Mayor Michael Bloomberg’s PlaNYC 2030, a long-term vision to improve the city’s land use, air and water quality, energy infrastructure and transportation systems. The city received accolades for transforming 49 acres of road space, traffic lanes and parking spaces into 255 kilometers of protected on-street bike lanes, as well as pedestrian areas and public plazas. Other notable accomplishments included planting 98,000 trees, implementing a select bus service and introducing car-free Sundays, similar to what can be seen in cities like Amsterdam, Copenhagen and Bogota. This year marks another record-breaking achievement: For the first time in the six-year history of the award, all of the finalists are cities in developing countries, as officially announced last week by the Institute for Transportation and Development Policy. Who are the finalists this year? Ahmedabad's Janmarg is a "game-changer" for India. Photo via Wikipedia. The first complete BRT system in India and all of South Asia. 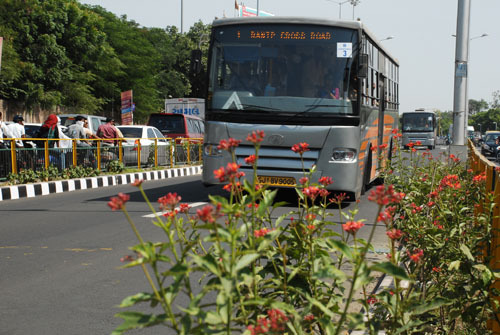 Delhi and Pune both have bus systems, but are weak examples of full-scale, high-quality BRT. The Ahmedabad Janmarg is a global “best practice” of BRT, as explained in a recent interview with EMBARQ Senior Transport Engineer Dario Hidalgo, one of the judges on the Sustainable Transport Award Committee. Ahmedabad’s new system signals a paradigm shift for medium-sized Indian cities. Exemplary design elements, including segregated lanes, pre-pay stations, level boarding, electronic fare collection, central control. Relatively small impact on increasing mobility in the city, given that the line is small and located on the periphery of the city. But the city is ambitious about its expansion. A three-month fare-less trial with partial launch of the system was an example of a poor financial model for launching transit systems. Low-quality passenger vehicles in an attempt to contain costs. 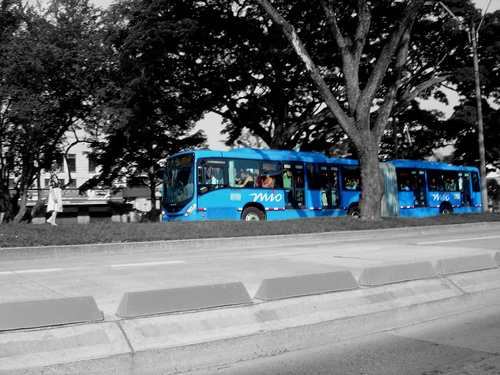 Cali's MIO changed the city's mass transit system. Photo by Manuel Vieda. Involved a comprehensive reorganization of the city’s transit systems that reduces the need for transfers. It is a vast improvement over feeder-trunk systems instituted in Bogota and Pereira. Implemented despite strong opposition from informal transit providers. Highest ridership of all nominees (170,000 passengers daily). Poor municipal leadership and a changing cast of characters lead to a prolonged implementation timeline. Small relative impact given that the line is small and on the periphery of the city. But, like Ahmedabad, the city is ambitious about expansion. 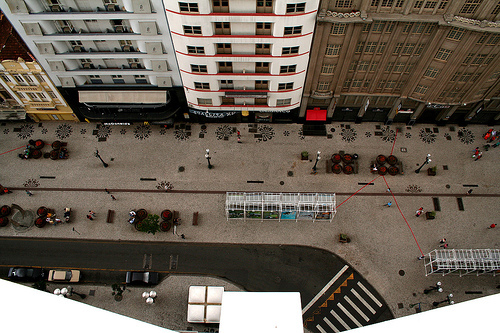 Curitiba is known for its people-friendly public spaces. Photo by Mathieu Struck. Follows in the footsteps of Brazil’s storied excellence in transportation and land use policy. Ethanol buses provide lower possible greenhouse gas emissions. Exemplary design elements, including improved public spaces, “overtake” lanes at stations for passing buses, etc. Some delays for launch date. Supposed to be fully open by early 2009. 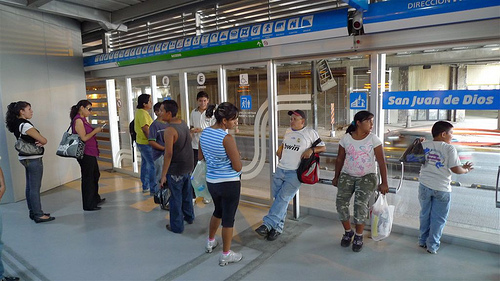 Following in Mexico City's footsteps, Guadalajara is changing the way people move around their city. Photo by itdp. Comprehensive integration with rail and feeder bus services. Quick implementation – just two years! Second-highest ridership among nominees – 120,000 passengers daily. Poor design of public spaces around the system. Sidewalks are narrow and many were under construction during the first months after initial operation. The feeder-trunk operation requires inconvenient transfers. 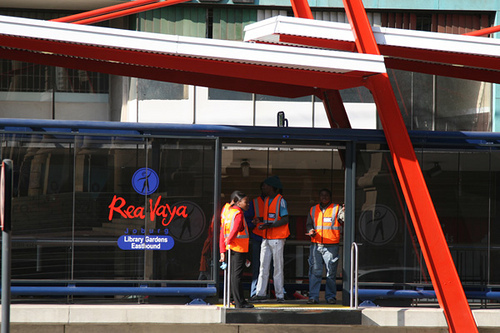 A brand new Rea Vaya bus station in Johannesburg, South Africa. Photo by Maneno.org. Connects communities, from the emblematic Soweto neighborhood to the downtown district, in time for the 2010 FIFA World Cup. Implemented despite strong and dangerous opposition from informal taxi industry. Quick implementation and extremely high quality. Additional contributions to this post from blogger Erica Schlaikjer.